Learn how Fero Labs and Intel are empowering machine learning in manufacturing through a combination of hardware, software and cloud-based solutions. Manufacturers today need to fight against shrinking profit margins while transforming established processes to become more data-driven. The good news is that these changes do not need big investment, and the benefits they bring can not ...only cut costs, but also increase productivity, streamline operations and enhance quality with advanced analytics. 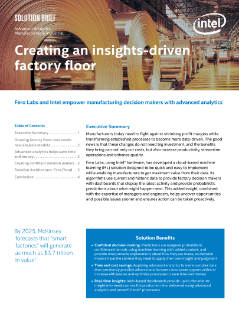 Fero Labs, using Intel® hardware, has developed a cloud-based machine learning (ML) solution designed to be quick and easy to implement while enabling manufacturers to get maximum value from their data. Its algorithms use current and historic data to provide factory decision makers with dashboards that display the latest activity and provide probabilistic predictions about what might happen next. This advanced analytics insight, combined with the expertise of managers and engineers, helps uncover opportunities and possible issues sooner and ensures action can be taken proactively. The Fero Labs solution, powered by Intel® technology, integrates with existing technology and processes, helping minimize the cost of implementing advanced analytics and achieving a faster return on investment (ROI). It offers engineers and production line managers a real-time view of what is happening across hundreds of variables, enabling them to identify and respond to issues and opportunities faster, or even uncover important insights that would not be visible at all using traditional analytics. It also provides predictions, based on current and historical data, about what might happen next. Using an approach based on machine learning with added context, each prediction has a confidence interval assigned to it, which empowers the decision makers in the process to make more informed, more timely decisions that help improve outcomes from end to end. It also provides users with interpretable data that helps them identify the source of any issues, so they can take steps to resolve it permanently.